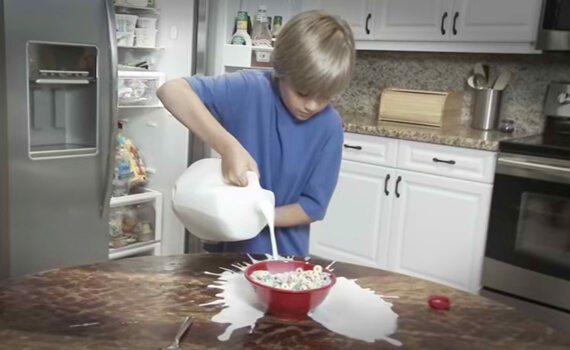 Just another…yawn!…ordinary day: wake up, dress, pour a gallon of milk near your cereal bowl and watch it cascade over the breakfast table. Does this remind you of your ordinary morning? I doubt it (and if so you should be reading this instead). We all have awkward moments but usually when we drop a bowl of cheesy puffs it doesn’t elicit the epic flail of DRTV. So what is it about presenting this unreal, over-the-top mistake that makes it so massively effective? What is so universally captivating, engaging, and dare I say it, significant about the Epic Flail? It’s been said that the first order of business for great DRTV is to “grab attention.” In fact, researchers say that when it comes to attention grabbing, the first five seconds of a commercial are literally all that count. So that first five better be good, not just good-information-good, I’m talking about 5 seconds of neuro-rocket explosions in the viewer’s brain. Mirror neurons fire brain rockets! In the early 1990s neurobiologists discovered something interesting about how the brain works when it’s observing. When someone drops a bowl of cheesy puffs and subsequently thrashes about as they try to catch it midair, neurons that control these movements are popping like fireworks. It’s funny (which is excellent) but even more importantly, the observer experiences an unconscious stimulation. The brain is engaged, and an engaged mind is paying attention. Any advertiser worth their salt must break through the fog, jolt the viewer, interrupt the pattern. Epic Flails break through the pattern with incongruity. They are incongruent in the normal course of life because they are unexpected. Recently, I watched The Bill Murray Stories, a documentary of spontaneous encounters with the elusive, comedic veteran, who “touches lives by simply showing up anywhere.” Within the context of “ordinary life” Bill Murray shows up, washes dishes or eats lasagna or bartends or plays some kickball and then leaves, having left an indelible mark on the memories of everyone there. Likewise, an epic mistake is incongruous: the action is not in accordance with the way things are supposed to go. The Epic Flail is a wake up call, an attention grabber, a pattern disruptor. The milk is supposed to go into the bowl, but it didn’t: it went everywhere! It seems so simple, and it is. Something is off, and we notice. And suddenly, we’re paying attention. Ask the Brains: Why do we Laugh?